Members of the High Follow-up Committee for Arab Citizens of Israel announced on Tuesday the launch of their own struggle against the controversial Nationality Law, demanding its cancellation. The High Follow-up Committee for Arab Citizens of Israel turned to the EU foreign policy chief, Federica Mogherini, and the UN Secretary-General, Antonio Guterres, demanding them to immediately intervene and support the cancellation of the law. Muhammad Barakeh, head of the High Follow-Up Committee, said in a statement "we're saying these things not on behalf of a party or a movement in the Arab population, but on behalf of the Arab public in general." Barakeh stressed that "we demand the unconditional cancellation of the law." Adalah, the Legal Center for Arab Minority Rights in Israel also filed a petition to the Israeli High Court of Justice against the Nationality Law, calling it a bid to progress "ethnic superiority by promoting racist policies." 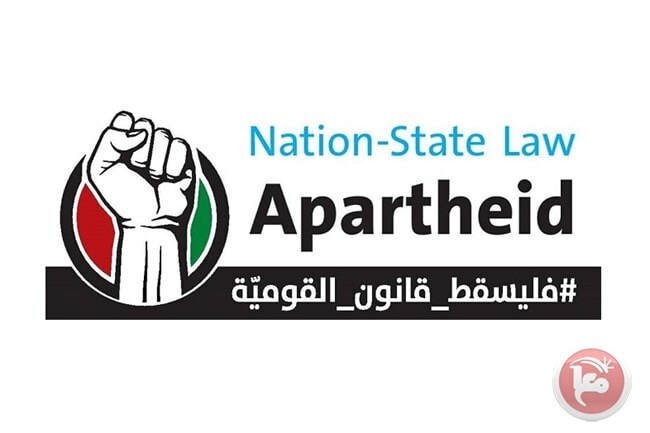 Adalah said that the law "has distinct apartheid characteristics" and denies "civil and national rights of Palestinians in their homeland." On Saturday, tens of thousands opposing the law had demonstrated against it in Tel Aviv, calling for its annullement to ensure equality for Israel's non-Jewish minorities. The law, which was passed by the Israeli Knesset in July, enshrines the status of the State of Israel as the nation state of the Jewish people and includes legally preserving Israel's "democratic" character, its state symbols (national anthem, flag, icon), Jerusalem as the capital of Israel, Hebrew as the official language and the right of return for Diaspora Jewry. Meanwhile, the Arabic language will receive a "special status" as Israel's second official language. The law, however, would not require making state services accessible in Arabic. Critics of the law raised concerns that it will permit the exclusion of various populations, based on nationality or religion, and allow the illegal establishment of Jewish settlements and communities only. Meanwhile, supporters believe it ensures the Jewish character of the state for generations to come. 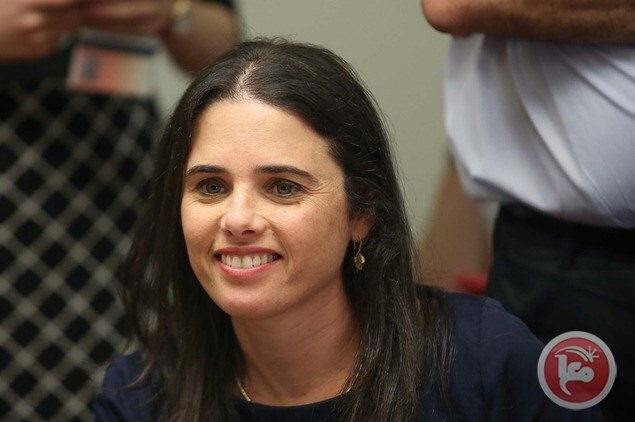 Israeli Minister of Justice, Ayelet Shaked, warned of an "earthquake" to occur in the case that the Israeli High Court of Justice decides to overturn the controversial Nationality Law. 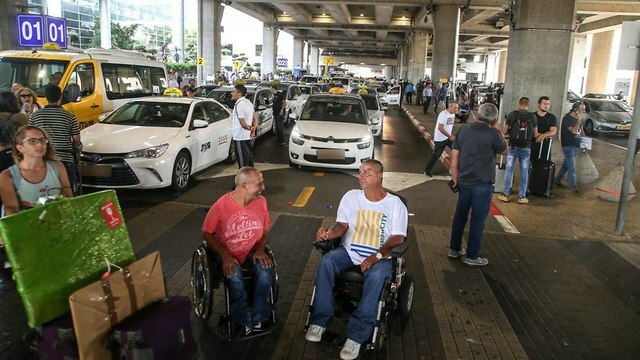 'Disabled Black Panthers' picketed Ben Gurion airport's busy departures hall and exit road as part of effort to match allowance with minimum wage; 'Our struggle is for the whole Israeli society' they told frustrated passengers, drivers. Some 30 activists from the “Disabled Black Panthers” protested Tuesday afternoon across from Ben Gurion Airport’s main departures hall as part of their efforts to raise the allowance they receive from the state. The protesters blocked the airport’s exit road chanting “We want justice not charity,” “Justice for the disabled, not for the rich,” and “Shame on the government.” Police officers handed out water bottled to the protesters in consideration of the hot weather. “We do not know whether to choose food or medicine. We are in a horrible predicament. We won’t quit until the allowance is raised to the minimum wage,” said Dalia Atal, one of the picketers. Other activists expressed rage at what they feel is a “corrupt government” throwing crumbs at them. “We are here at Ben Gurion to demonstrate that the disabled are not transparent. Next time we will up the notch in our struggle,” said Eyal Cohen, a leader of the protests. In contrast to previous protests, which had erupted suddenly and without prior warning, the organization behind the current one did announce their intentions in advance. Previous protests involved blocking major highways and access to important infrastructure sites as well as the entrance to the homes of senior public officials. The Airport Authority warned passengers in advance to arrive early for their afternoon and evening flights. Some 92,000 passengers are expected to pass through the airport on Tuesday. The disabled activists have been protesting for over a year over their state allowance which has not been updated since 2002 until the Knesset raised it to NIS 3,270 a month half a year ago. By 2022 the allowance is set to be raised to NIS 3,700, but they are demanding that it match the minimum wage: NIS 5,300 a month. Bayit Yehudi launched a campaign in Jerusalem in order to shake up the race for mayor of the city, claiming only members of its party will be able to effectively counter the ultra-Orthodox influence on the life in the capital. The party does not actually have a representative running for the position and the three leading candidates currently in the race are: Ze'ev Elkin (Likud), member of the city council Ofer Berkowitz and Moshe Leon, who is running as an independent candidate. All three are reinforcing the ultra-Orthodox message in order to increase their chances of winning. The Bayit Yehudi campaign explores this aspect as they put up banners around the city showing the three candidates wearing photoshopped ultra-Orthodox attire. "While they are worried about their fate, only a Bayit Yehudi win will stop the influence of the ultra-Orthodox," exclaims the banners’ slogan. The slogan of the campaign, incidentally, is reminiscent of the famous statement about the casino: "In Zionist enterprise - the house always wins!" The goal of the campaign is to increase the number of its members in the city council—which currently has only two Bayit Yehudi members serving there—Hagit Moshe, head of the party’s Jerusalem branch and Dov Kalmanovich. "We have nothing against the Haredim, but the reality of life proves that making Jerusalem more and more ultra-Orthodox keeps the Zionist and secular public away from it," said a party’s representative in the city’s municipality. The party’s campaign is a strategic change since Kalmanovich, during his last term in office, voted with the ultra-Orthodox on various issues, such as against the decision to allow businesses to stay open in the city during the Shabbat. The party reiterates that the campaign is about the composition of the next coalition in the municipality, no matter who wins the election. "Elkin, Leon or Berkowitz, must not face the ultra-Orthodox by themselves. The religious Zionism factions must play a big part in the coalition in order to ensure that Jerusalem will be a capital of all Israeli society, not only of a small sector," said Hagit Moshe. 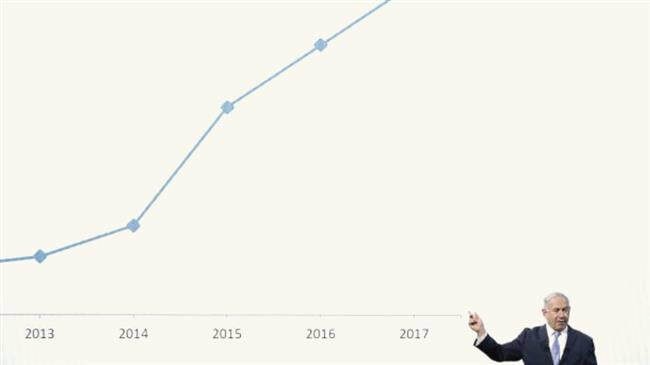 The data indicates that over the past years, the mayoral elections in the city have been decided by the ultra-Orthodox public. In the 2013 election, Nir Barkat won by forming an alliances with the Haredim. The National Union party strongly condemned the campaign saying it is designed to create a division between the right-wing factions. "The National Union party wishes to distance itself from the painful campaign. Jerusalem is a city of unity, and creating division among the population is not our way. We’re investigating with our partners how such a campaign could have gone ahead and we’ll make sure it is shelved immediately. It is unacceptable to us and we apologize for the terrible mistake that has been made, and ask for forgiveness of all those who have been hurt by it," concluded the statement. Chairman of the Bayit Yehudi party, Naftali Bennett, has also denounced the campaign saying he had no prior knowledge on the issue. "The Bayit Yehudi party strongly condemns the elections campaign created by the party's Jerusalem branch. The leadership of the party on the national level had no prior knowledge on the matter and does not share the views represented in it," said the education minister via his official Twitter account. MK Ze'ev Elkin also addressed the issue in an interview with Ynet, denying claims he intends to pander to the Haredi electorate. 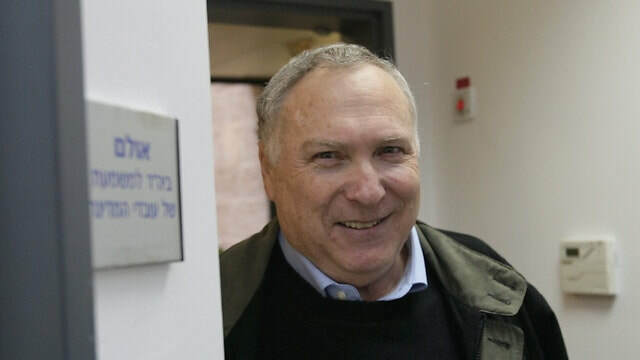 "I hear that there is great resentment towards the campaign within the Bayit Yehudi party, because it is really unwise … I have had four years of experience heading a coalition made up of both: ultra-Orthodox and anti-religious parties, and I knew how to connect all of them together when a complex decision had to be passed. You can not blackmail or overpower me," he exclaimed. Jerusalem Deputy Mayor Yossi Deitch praised Bennett’s decision to distance himself from the controversial campaign. "I welcome Education Minister Naftali Bennett’s quick response and condemnation of this ugly campaign,” he added. Deitch also urged the candidates to be respectful to each other. “I call on all the candidates and all the parties: Please watch your language and run a campaign that is respectful towards every person and every sector," he concluded. Radical Jerusalem Faction organizes protest after Yeshiva student arrested for refusing to acknowledge draft notice, they insist on no cooperation with any draft law short of blanket exemption for Haredim. 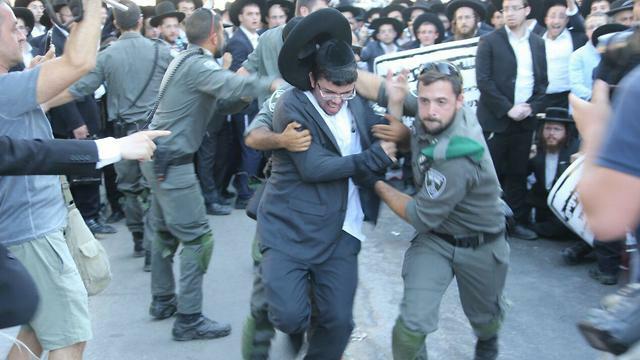 Some 500 Haredim associated with the radical Jerusalem Faction are protesting the military arrest of a Yeshiva student, Monday afternoon in Bnei Brak. The student was arrested for his refusal to show up for his scheduled draft or deferment request. The protesters held signs accusing the state of persecuting the religious populace, “destroying souls,” and “we will rather die than enlist.” At least 19 arrests were made. The leaders of the Jerusalem Faction instructed their followers to continue the legacy of their founder and spiritual leader the late Rabbi Shmuel Orbach, who passed away in February. Their policy is to “shake the foundations of the world” over each arrest of a Yeshiva student who refuses to show up at the IDF’s recruitment center and is sent to military prison. Police responded in large numbers and have closed several main roads in the vicinity of the protest. The primary thoroughfare affected is Jabotinsky Road running from east-west and connecting Tel Aviv to Petah Tikva. Police are hoping to prevent the closing of Highway 4, as has happened in previous protests. “The Israel Police will not prevent this protest from taking place so as to allow the freedom of speech and protest to all citizens. That said, we will not allow any public disturbance and we will respond firmly to any violence,” said a statement by the police. Natan Eshel, Prime Minister Benjamin Netanyahu's former bureau chief, has suggested Druze Israelis protesting the Nationality Law should instead join their brethren in Syria. "After going forward with it, not a single word must be changed in the Nationality Law. Those who don't like it—there's a large Druze community in Syria, they're welcome to establish the state of 'Druzia' there," Eshel was quoted as saying by journalist Amnon Abramovich. Eshel also reportedly told different officials that "Bibi wants the Druze to not have a problem, and the Druze want Bibi to not be here," using the prime minister's nickname. The Prime Minister's Office was quick to distance itself from Eshel. "This kind of statement contradicts the prime minister's views and his work for the Druze sect. It's ridiculous to try and attribute (this position) to him," the PMO said. Eshel said in response, "Without addressing your question—I am not the prime minister's spokesperson, and I say things only on my own behalf and at my own discretion." Over 90,000 people protested the Nationality Law at Rabin Square in Tel Aviv on Saturday night, calling to change the legislation. Some 2,000 more protested in Arab towns and cities across the country. On Thursday, an attempt at reconciliation between the prime minister and Druze leaders failed when Netanyahu cut the meeting short after one of the Druze leaders, Brig. Gen. (res.) Amal Asad, called Israel an "apartheid state" in a Facebook post. 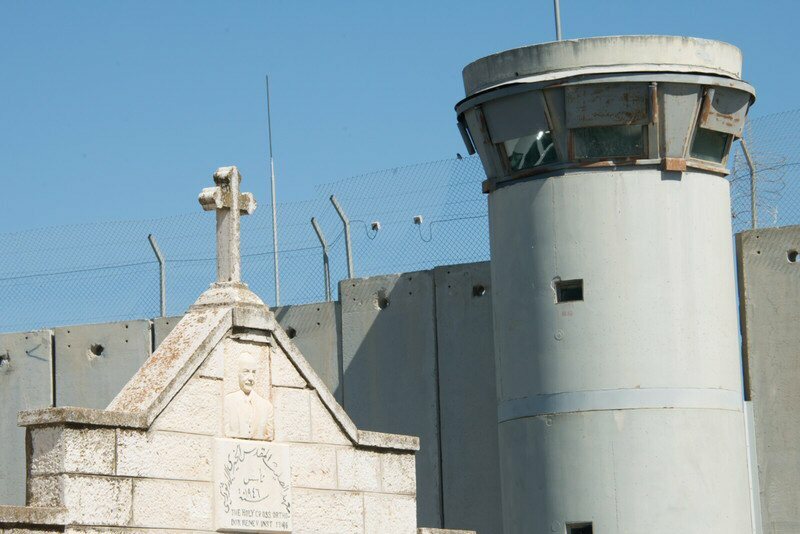 Heads of churches in Israel and the Occupied Palestinian Territories have reacted with dismay and concern to the Israeli Knesset’s adoption, on 19 July, 2018, of a new Basic Law: Israel as the Nation-State of the Jewish People, which specifies that “The right to exercise national self-determination in the State of Israel is unique to the Jewish people,” according to a World Council of Churches (WCC) statement published on Friday. A statement by the Latin Patriarchate of Jerusalem stressed that “the law fails to provide any constitutional guarantees for the rights of the indigenous and other minorities living in the country” and “sends an unequivocal signal to the Palestinian citizens of Israel, to the effect that in this country they are not at home.” The downgrading of Arabic from an official language to a language with “a special status” strengthens that signal. Patriarch Theophilos expressed concern that this provision will strengthen the hand of settlement groups seeking to seize church properties in Jerusalem and elsewhere. He stated that key proponents of this new law represent the same bodies that have sought to enact a law allowing the State of Israel to confiscate the lands of all churches – which Prime Minister Netanyahu pledged to prevent, in discussions following the decision by the heads of the churches to close the Church of the Holy Sepulcher in February, this year.